I knew that simply cutting up your fabric wouldn't keep y'all at bay for too long. Are you ready to make some blocks?? 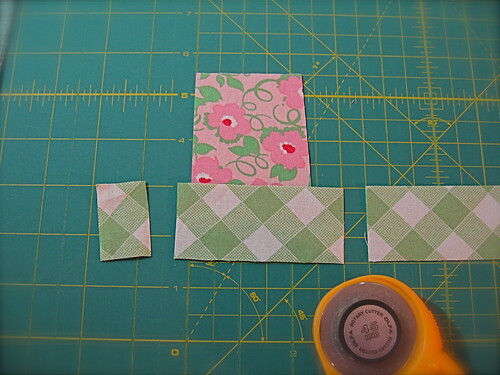 If you want to try out all four types but aren't sure yet which you want to use in your quilt, you may want to make one of each with some scrap fabrics. 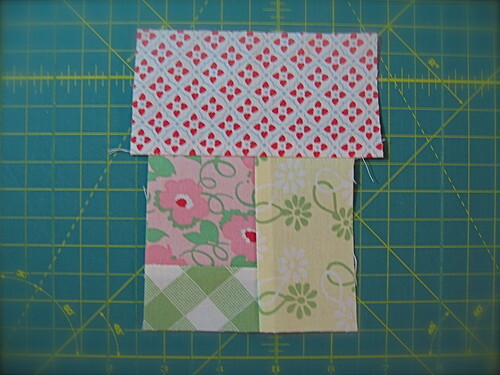 Of course, you might want to use all 4 types in your quilt, in which case you can use your "real" fabrics. 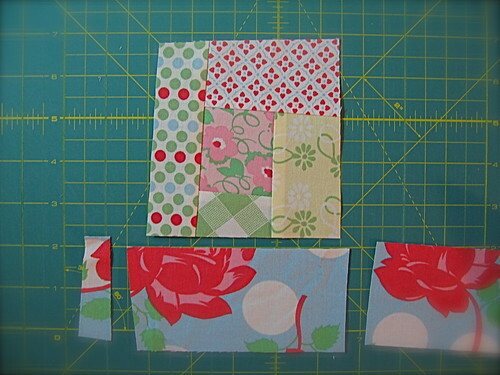 I do think you should have enough fabric to make all 4 from your cut fabric if you choose to do so, even if you don't use all 4 in your final quilt. You can always piece the extras into your backing, or make some matching throw pillows! We're going to start with our center square. 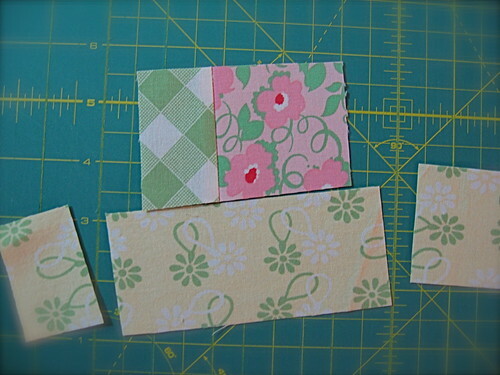 Choose one of your 2.5" strips -- any one -- and cut a 2.5" square from it. If you've designated a particular fabric for your centers, use that one. Of course, you can start with any size strip you want. 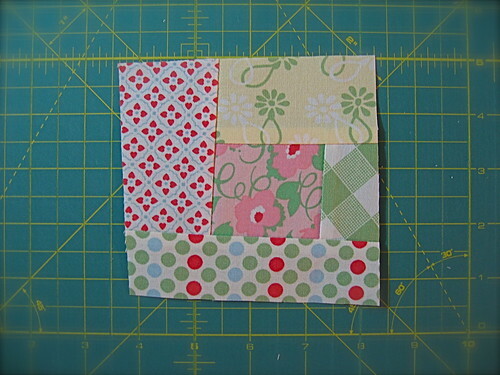 On later blocks you may choose to mix it up and start with a 2" square or even a 1.5" square. I just like to start with a 2.5" square, so that's where we'll start. The only thing you shouldn't start with is one of your 3" strips. We're saving those for later. Now it's time to start giving your block some personality. 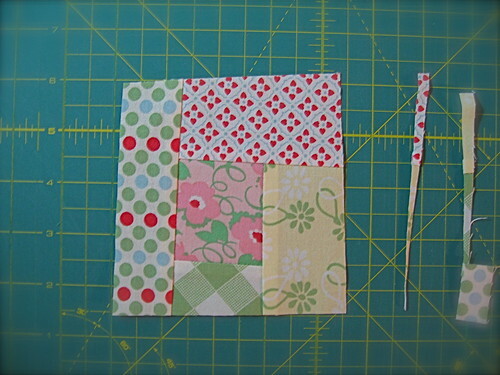 Choose a side of your center square and cut a bit off. Just a bit, and at an angle. One thing I should mention here is that my personal preference is for "subtle wonk". Other people like more "severe wonk". I will always default to softer, more nuanced cuts, but feel free to cut as severely as you like! Just remember, don't ever cut a log so severely that any part of it ever becomes smaller than 0.5" in width ... you will risk losing that part of your log in the seam allowance. On later blocks you may decide to cut a bit off of 0 sides, all 4 sides, or anywhere in between. I thought that just skewing one side was a good place to start. Select another strip for your first log. It can be any size width that you want (except for your 3" strip ... remember, we're saving those for later). I chose to start with a 1.5" strip. 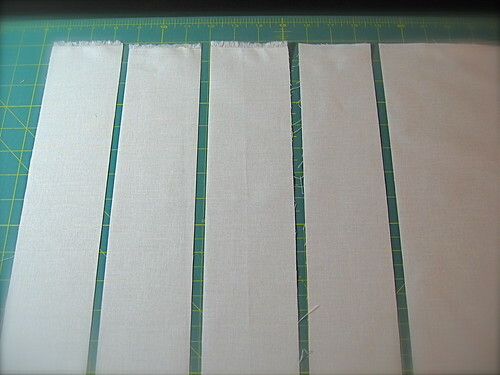 Be sure to cut off the selvedge, and then cut the strip roughly the width of the center square. Because I haven't mentioned it yet, let me tell you that you don't have to measure the length of your strip. That's my favorite part about making these blocks ... I don't measure anything!! You will notice that I almost always cheat a little bit on both sides of the block. I don't even use a ruler when making these cuts. 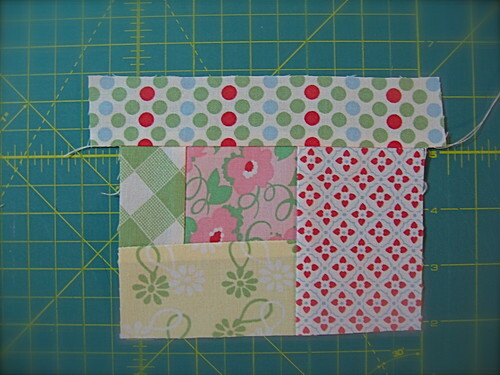 Sew your first log to your center square and press your seam. I always press my seam toward the log that I just added. 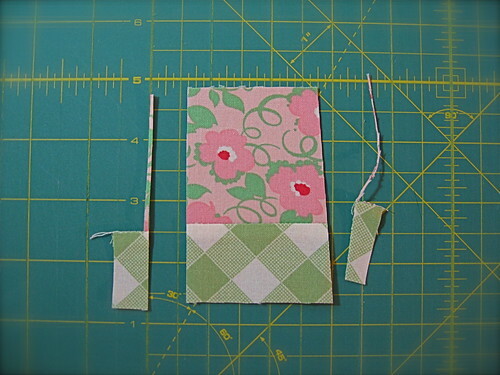 So, in this case, the seam is pressed toward the green gingham fabric. 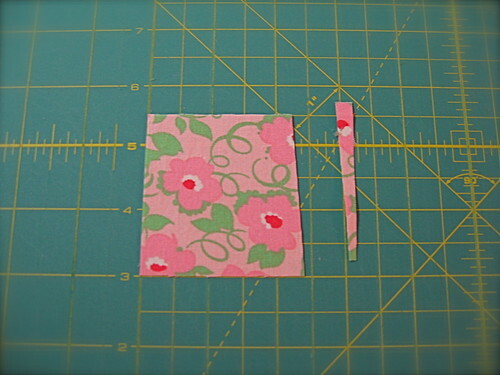 Now, using your ruler, trim the sides to give your block two nice, straight edges. Here's yet another chance to tilt your ruler a bit. 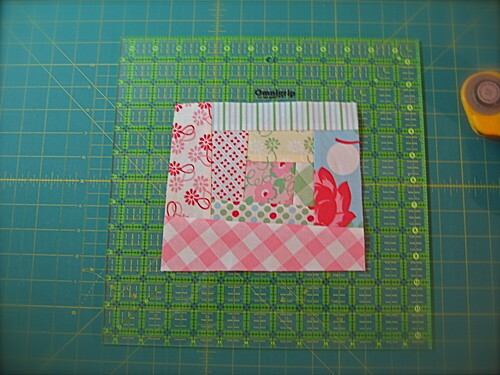 No need to use your cutting mat's guides to cut straight lines. Now you have the beginnings of your block. Turn it clockwise 90 degrees. Choose another strip to serve as your second log. 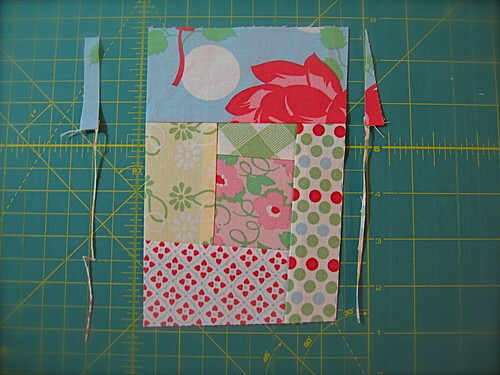 I chose a wider strip here -- I think it's a 2" wide strip. Again, cut off your selvedge (if you have one) and cut your log slightly wider than the edge to which you will be sewing. Sew together and press toward your new log. Here, I pressed toward the yellow fabric. Grab your ruler and trim the two sides. Turn the block 90 degrees, and repeat these steps to add your third log. I selected a wide strip for my third log. It's one of my 2.5" strips. We have now completed our first round of logs. 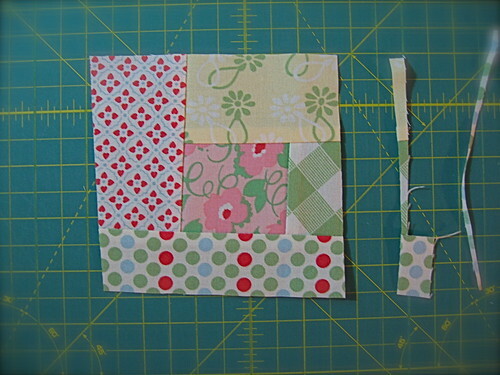 This is the point at which I like to make some wonky cuts. See that red & white log on the right side? It seems a little too wide to me. I'll say it again ... I prefer subtle angles to more severe ones. But if you want to make very severe cuts, feel free -- the method and steps are still the same. Remember that 12.5" square ruler that I recommended? Here's where we'll start to use it. After every complete round of 4 logs, I like to check and see how I'm doing towards my ultimate goal of a nice, even 12.5" block. Continue on with your third round. Notice how, at this point, my block is a little bit wider than it is tall? No big deal ... I am not going to cut it to get it more square. 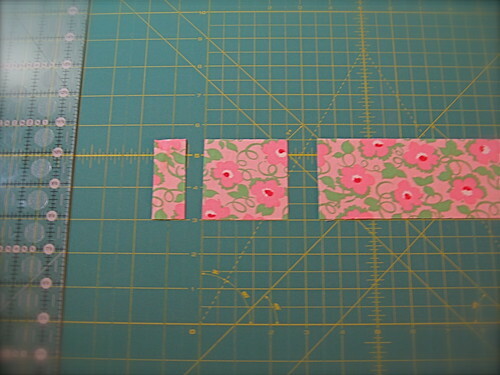 However, I am going to be conscious of my strip selections -- I am going to use narrower strips on right and left, and wider strips on the top and bottom, in an effort to stay in square territory instead of winding up with a rectangle. Now trim down all four sides of your block again, determining as you go whether you want to add some wonk to any of your sides. A little bit of wonk on that white border. It seems too wide to me. Are you starting to see how using some of the wider strips gives you more flexibility in skewing the angles on your logs? Here's a tip: if you keep cutting your angles in the same direction, your block will begin to take on a spiral-like effect. To avoid this, alternate the angles of your cuts. For example, look at the picture above. See how the pink gingham log is narrower at the top and wider at the bottom? Recognizing this, I made sure my trim of the white log is wider at the top and narrower at the bottom. It evens the two out. 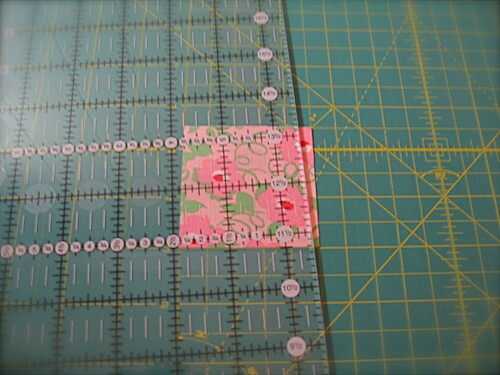 Based on my 12.5" ruler guide, it looks to me like we have enough room for one more border. This is where we will use our 3" strips. I like to err on the side of very wide borders for my outermost borders, because I really dislike thin outer borders. 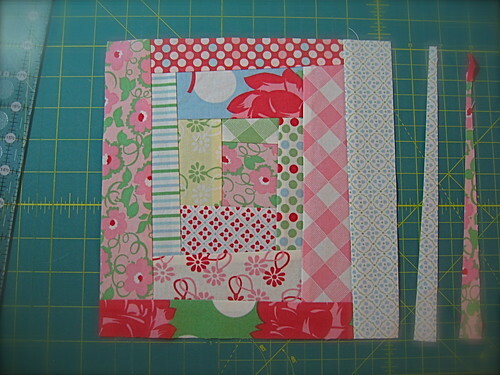 For example, you can see from the image below, if I decided to use 1.5" or 2" strips for my next border, I would then have to add another round of very thin borders. I like to overshoot my final round of logs, for reasons that will become clear in a moment. 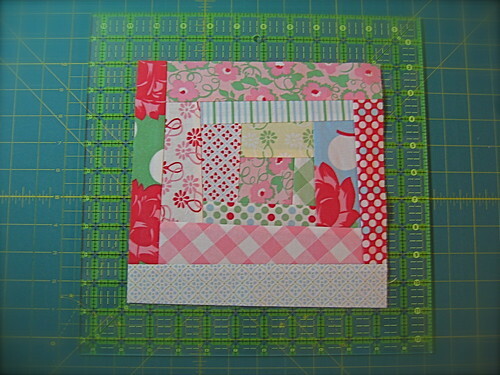 Here's my block with its final four 3" strips attached. No need to really trim this round as you go, because we will square it up to its final size. 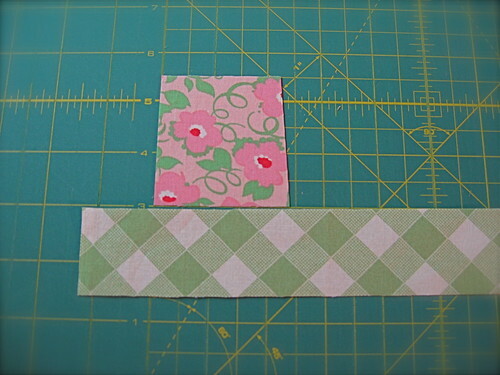 From your sashing fabric, cut 3" strips. "Why are the sashing strips so wide? ", I can hear you asking me. "My block is bigger than 15.5"!" I know, I know ... but that was deliberate. It's wider for the same reason we had wider strips up above -- it gives you more flexibility in how you trim down your block. And now you see why we didn't just use traditional horizontal and vertical sashing strips. This way, your interior blocks can all be slightly tilted (and wonky! 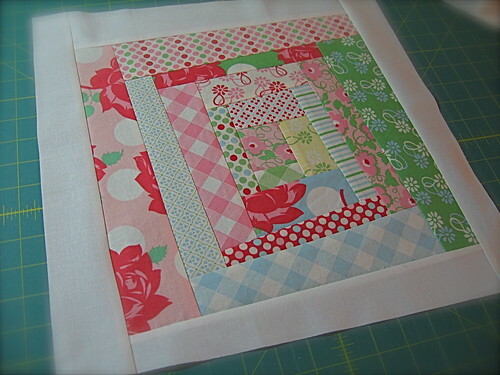 ), giving your final quilt that added touch of interest, whimsy, and movement. 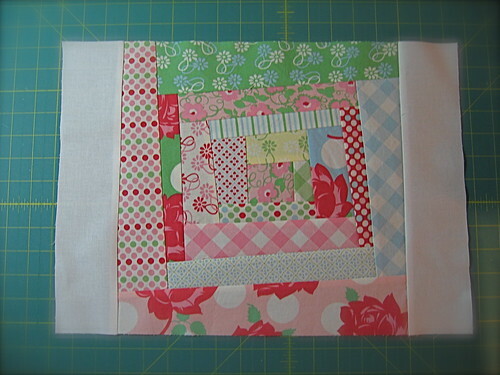 And here it is, your final 15.5" block! How'd it come out? Is this what you were expecting? I'd love to hear your thoughts, feedback, questions, concerns, corrections ... please let me know either here in my comments or in the Flickr group. Of course, I'd LOVE to see your first blocks! 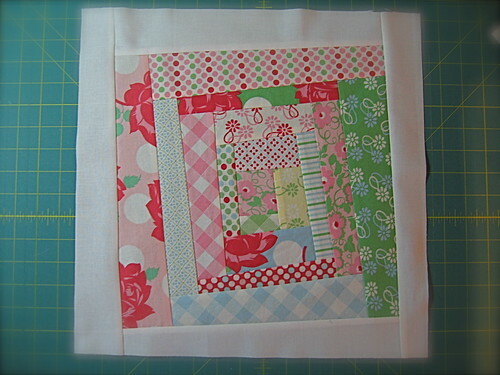 I won't be sashing the blocks in my quilt, which means I won't be using the block I made for this tutorial. 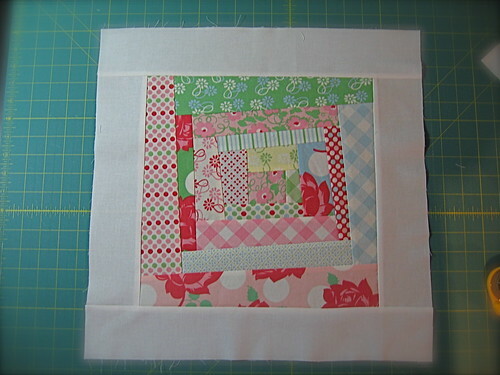 I will make it into a quilted pillowcase for one lucky reader! Simply leave me a comment on this post to be entered to win. I am going to limit this giveaway to those quilting along with me, so please let me know your Flickr name in your comment. 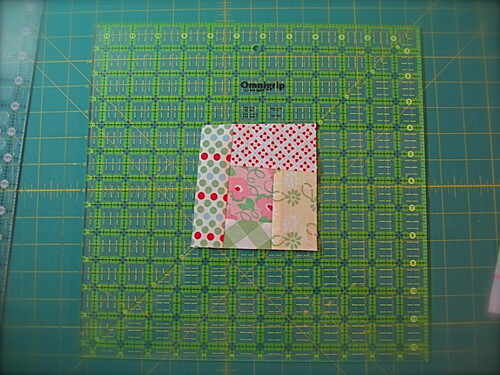 I will use the random number generator to select a winner, which will be announced in the next quilt along post. Excellent instructions! Can't wait to start this weekend! Amazing instructions... to the point, clear and well thought out. This is my first follow-along and glad I choose yours for my first! Can't wait to show off my first block! Wow, John, those are the most amazing instructions. 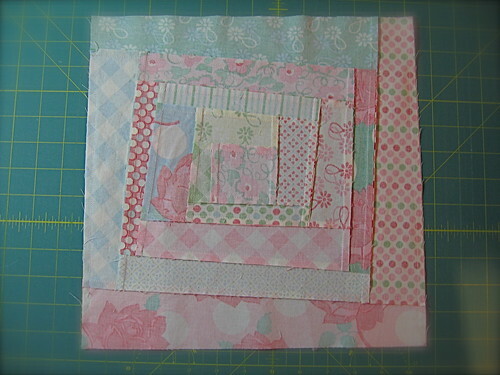 I've made a couple of wonky blocks but have picked up so many tips here - particularly the sashing one at the end. Good job, mister! P.S. Yeah, I'll be Ochil_Lynz on FlickR!! Wow, those are great instructions John. 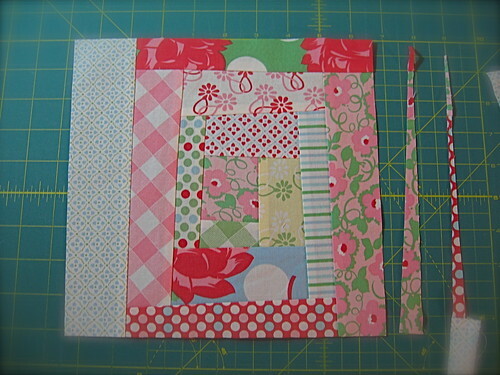 I hope to start making my blocks this weekend. I go by SHERI A on flickr. Oh man...I am so mad I have to wait until Monday to start!!!! ARGGG!!! I am so excited!!! I think that pillowcase would be awesome in my home!!! Hope to win! Thanks for putting so much time into this tutorial! kim matthews on flickr...can't wait to see who wins! Ok, I CAN'T STAND IT!!! I'll be posting my fabric tonight on the Flickr group. I was in the 1st QAL, skipped the 2nd but I'm doing this one! I just love the wonky look! Great instructions! ps...I go by big red tulip. I am doing this wonky one with you and also the railfence. I just found this quilt along. Such great learning! I go by denawayne on Flickr. Easy enough right? you know how to find me... and i've joined it.. i just didn't start cutting yet!! but once i'm not sick.. and have these 2 done for their deadlines.. its on! Great job! Can't wait to see the other variations before I choose. I'd love to be entered in the giveaway. My flickr name is scrapworking. THANKS! Great instructions John! I'm sitting out this round, mostly because I haven't started the zig-zag yet and REALLY want to get that one done. (and I still need to quilt Round 1) But I've been following you instructions, great work! Great tutorial, makes it seems easier than last time I tried getting wonk! Thank you, can't wait to see how the quilts progress.....flickr name is mleegarrett! Love the colors! 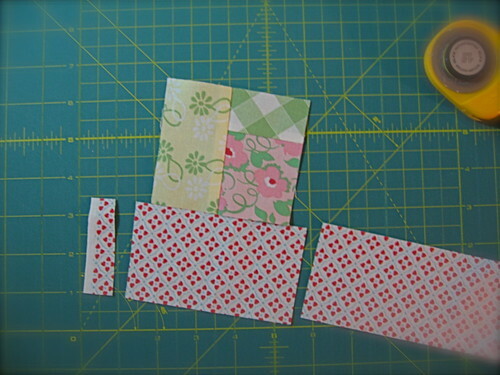 I'm hoping to start cutting my fabrics tonite! Gotta take and post pics, first, though! I still have to go find purchase my fabrics...I just happened upon this quilt along yesterday, and am very excited. It will be my first! I'm thankful for the amazing instructions! My flickr name is tracy.wright80. Sorry about that...I mean PURCHASE my fabrics....proofreading is key! ha! Great Instructions! I'm starting tonight. DH is taking the kids to a ballgame since they're all off tomorrow while I have to work, so I get to have my fun tonight...home alone with my fabric and sewing machine! Does it get any better?! I think not! thanks for the tutorial. i picked up a few new tips. i always appreciate that. i will be quilting along with you, but you don't have to add me into the draw. Great Instructions!! Can't wait to get started. Thank you so much for even attempting to work w/all us gals!! I am dying for the rest of my fabrics to get here so I can do at least one block before we go away for 2 weeks. GREAT instructions, John, thanks SO much! I can't believe how perfect the back of your block is.. so inspiring. P.S. I'm mendi_brown on flickr. I wish you had started your Quilt Along a month earlier; it would have made my Wonky Log Cabin for the APOWA bee so much easier. I had "wonkied" my strips before sewing them instead of after they were sewn & it was a bit of a pain. How fun to win this!I'm stephanielallgood from the flickr group! I just stumbled on your blog yesterday and boy am I happy I did. What great instructions. Great instructions John and I love the fabrics you are using. I am n@nci on flickr in the quilt along. Impressive quilting instructions John, very thorough. I will be bringing my project up north for the long weekend hopefully I will get some sew time in the evenings and Have my photo up on tuesday. My flicker name if ladmquilter. Thanks again for all the hard work you are putting into this. I think I got it! 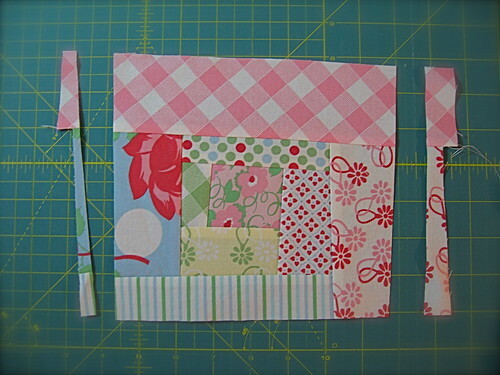 I have to admit I was holding off on the cutting of the strips until I saw the next step but now I'm super-confident. Bravo on the great instructions. 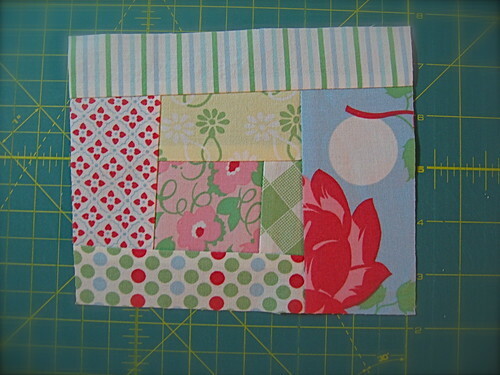 My flickr name is also BaileyGirl5 and I'm making this quilt for my newborn baby son who just went to college. Eek! How did that happen so fast?? 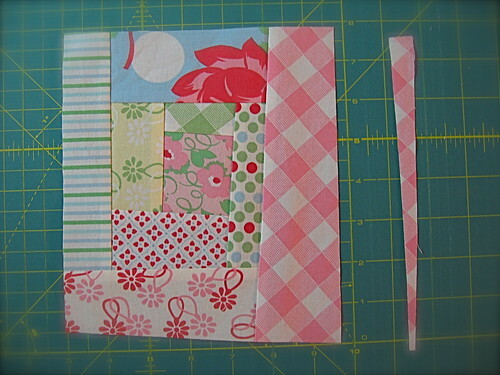 that would look really nice with the square in square quilt I have started with that fabric. Now to go start my first block. fantastic instructions, this weekend is going to be my wonky weekend!!!! After playing in my stash I decided to do a Christmas wonky log cabin. I'm lynnnc on flikr. Have a great weekend - it supposed to get hot again - but haven't the past few days been perfect? Hi! This is liebschien. This block so pretty! And you make it look so easy. I got all my fabrics ironed last night and I'm about to start cutting them this evening. I can't thank you enough for walking us through this fun quilt! Great instructions. Very clear and easy to follow. I agree with you, I like the subtle wonk too. A number of years ago, I was lucky to take a class from Sandy Bonsib here in Seattle. 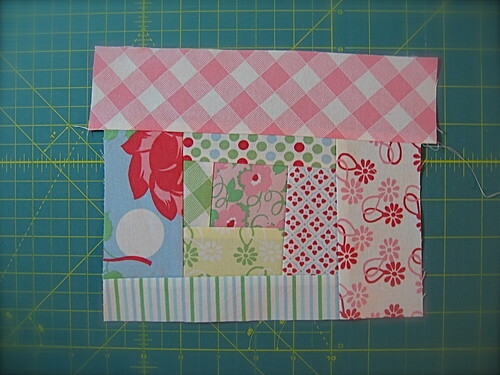 She teaches a class on folk art quilts that includes these types of log cabin blocks. Excellent pictures/instructions! I appreciate the detail. I'd love to win your giveaway, and my flickr name is scrapperdeb. Great instructions and I'm quilting along as Skovy! John - those instructions are fabulous! Thank you for so much detail and the pictures are great! I totally get it:) Also thank you for a generous giveaway! You are a GENIUS! this is so well explained - and solves some of the problems I had the first time I did a block like this several months ago. I can't wait to get started! I need to press and cut my strips first!!! THANK YOU SO MUCH! I think my 1/4" presser foot I just bought will help too! Thanks for the great step by step with photos; it really helps make everything clear. 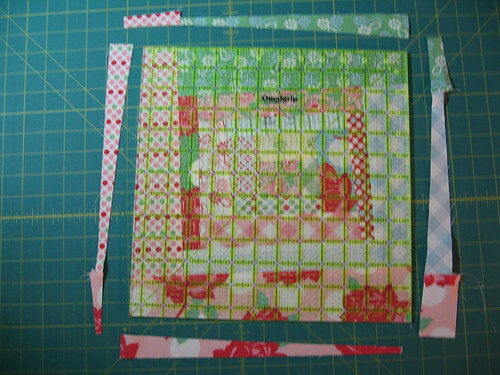 I am working on some Christmas/winter wonky blocks - will post pics tomorrow. my flickr is partridgepeartree. Thanks for the giveaway, John! That is an amazing and completely inspiring tutorial. Thanks so much for sharing it. I can't start a new quilt, but I definitely want to do this one soon. 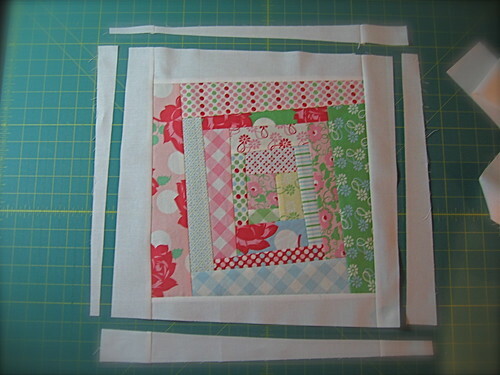 I really really want to quilt along this round especially after seeing your fab instructions. We are moving in less than 60 days and I have a whole stupid house to pack:( Maybe if I can make huge progress in packing over the weekend and finish quilting the first quilt a long quilt I will start cutting:)The rail fence is about 1/3 quilted and the zigzag needs to be basted etc! I just finished my first block, can't wait to do more. Hi, John. 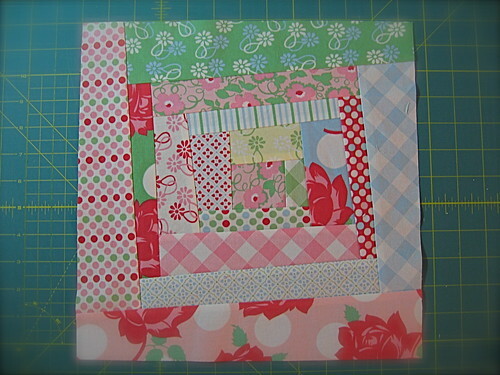 I follow your blog, am part of the flickr group, will be quilting along, and -- oh yes, love your block! Thanks for the great tutorial. I've just been picking fabrics out of my Amy Butler stash -- old and new. John, these instructions are great! I love how detailed you are! This is a cool giveaway-I need new pillows! My name on Flikr is Crazyfun01. I am so excited to get started, I will not be able to start for a few days as we are going out of town for the weekend. Great instructions, I am using KJR blue and greens for this, can't wait! What a great tute - articulate, easy to follow and the pictures were perfect! Count me in - I'd love to win this generous giveaway! I am seriously in love with this block! I hope mine turn out as cute. Brilliant instructions, by the way. Wonderful! Just what I needed for the virtual quilting group that I am a part of. 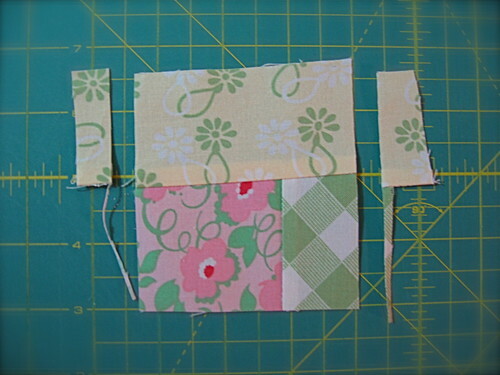 There are some who are fairly new to quilting and these instructions will work perfectly when my month rolls around. I can just direct them to your tutorial! Thank you. Great tutorial! Can't wait to get started! 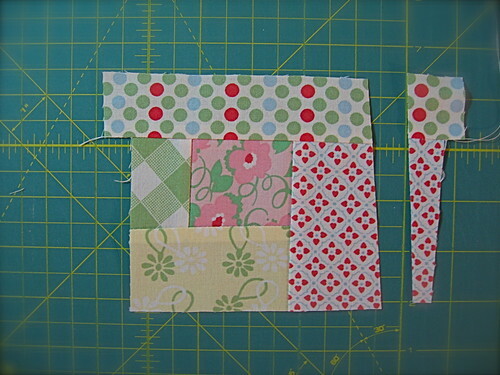 I have never posted on flickr so I don't have a name, but I cut out my fabric and made my first block last night. It was so fun. I love the freedom. Quick question: I want to sash my blocks but don't care if they are wonky inside the sashing - I can just sash the regular way right? What a great tutorial, I love it!! A fantastic, clear and well written tutorial! Thank you! Just came here via crazymamaquilts or is it crazymomquilts?! 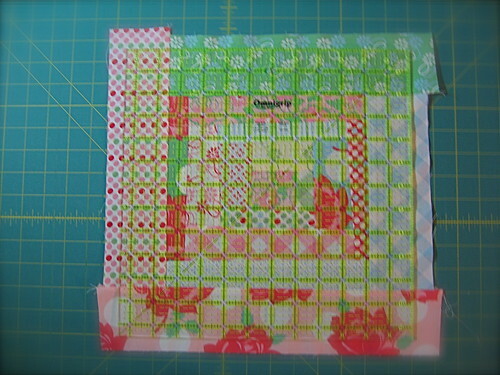 Anyway, I'm just a newbie at quilting and I'm so psyched to quilt along with you. I'm going to try a wonky square or two, maybe making them into potholders or something, and then it's on to quilt with a capital Q. Excited! So much information and inspiration. Great, great, thank you so much for the detailed tutorial. I can´t wait to start one of my own. Sweet, that block is so beautiful! I can't wait to get started! My flickr name is jenniferworthen. I've got a couple of Neptune Jelly rolls on the way..I can't wait to get started! Oops! Forgot to add my Flickr name..it's sidhe designs! Thanks SO much for your wonky tutorial!! I'd kind of figured the concept out... but your tutorial just made it completely clear. Pick me! Pick me! The instructions and pictures are fantastic. I hope I am not too late to start this!! 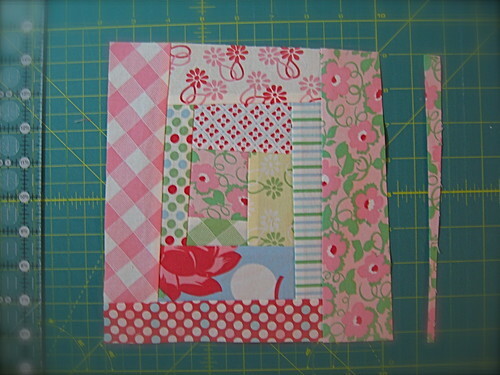 I am way behind, but hey not too much, just the fabric and cutting and the first block! LOL I am new to all of this, so I am very excited to join! And of course a chance to win that pretty pillow! AWESOME! Great instructions John! I've made many wonky log cabins by winging it so it is great to read a simple straightforward way of doing it. Thanks. Thanks for the freat onstructions. 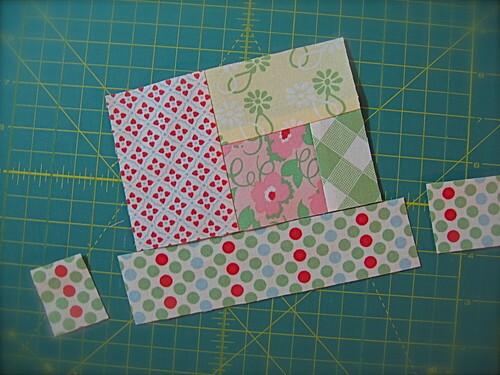 I can hardly wait to start my wonky blocks. Thanks for the tutorial! You did a great job and it was very easy to follow. I am a visual learner and this was perfect! I am in the flicker group ashleybwright83. Love the tutorials, and looking forward to the others! I was excited for this giveaway, I have the jellyroll for these prints! Yea! 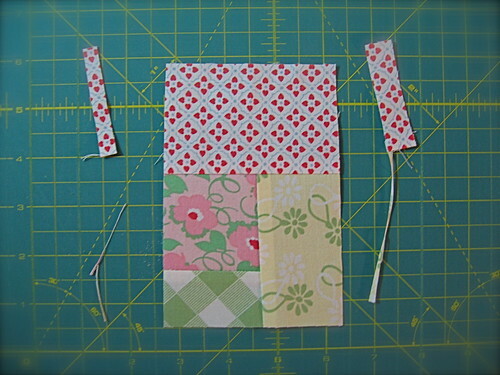 I'm pokey, aka pokeydot on flikr- but not posted yet on my fabric choices. Thanks! 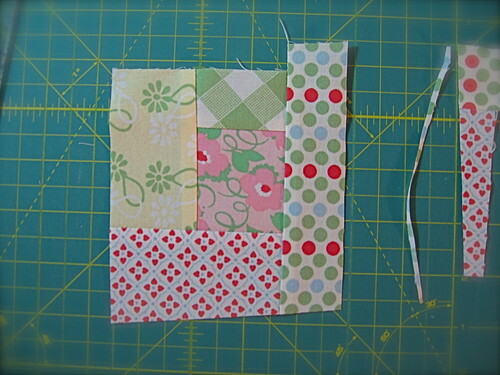 I've got scraps just crying out to be made into wonky blocks like these. Thanks for sharing! Thanks so much for these easy to follow directions! 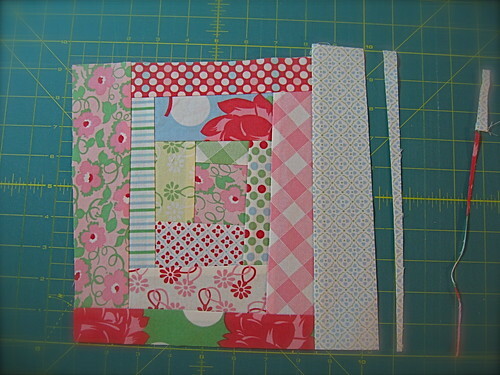 I can't wait to work on my quilt! 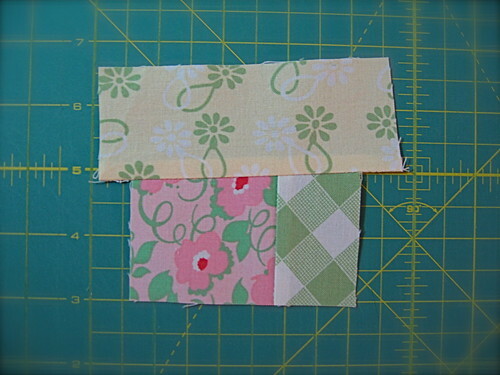 What a wonderful tutorial, with such lovely fabrics! Very inspiring. Thank you for your great tuto!!! Just to let you know I think your Wonky Log Cabin Block is great! I'm going to make one of them. Just joined. Hi john - I have been following your wonky pattern and loving it. I haven't started the sash yet but was wondering if you have a 15.5 sq ruler when you cut the final block or did you just use a straight ruler? Thank you John for the easy to follow tutorial. Great stash buster and a different slant( LOL ) to the log cabin. What a great tutorial.. I am going to have to try this one for sure.... 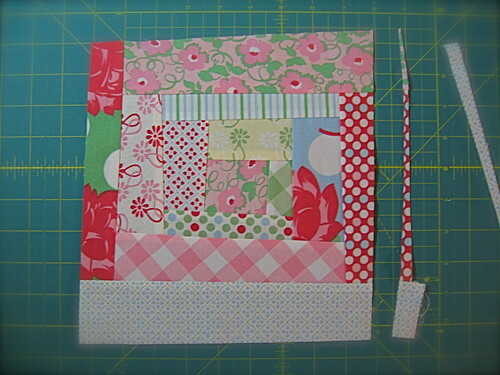 Thanks for sharing..
Just made two squares this weekend. I'm making a Halloween quilt and hope to use some Jason Yenter Hallowgraphix for the border. But the main squares will be wonky log cabins from your tutorial. I do really like how one doesn't have to be sooo accurate! It's really fun. I might post it on my blog and give you a link later this week. Thanks so much for the tutorial! Trying it tonight! Hi John! I absolutely love your wonky block tutorials and have made them several times. I'm stopping by to share that I've linked this tut to my blog at cottonaddiction dot blogspot dot com. I have not been following your Flicker group but wanted to say that your instructions are very clear. I am going to bookmark your page so I can come back to it for wonky log cabin directions. Thanks again. This is fantastic. I saw the "Wonky Town" quilt on Connecting Thread's blog and followed the links to your tutorial. Could I link up to this tutorial in a blog post (with proper credit to you of course!) 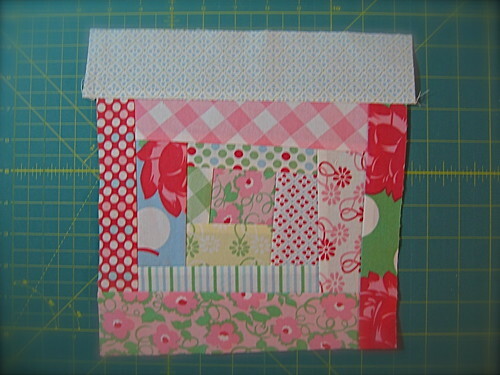 so I could have my bee partners make one wonky log cabin block for me? I am the first to go in January and have never done a bee before so I am a little nervous. I really love your clear directions. They are perfect! Thanks! Or I guess I'd be linking in a Flickr message actually! Sorry, I am new to this! Gorgeous block! Love everything about it: colors, shape, built-up! A winner! 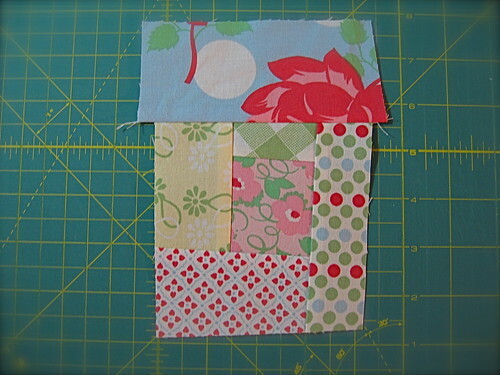 Just made your block as part of the Skillbuilder Quilt Along. Thanks for the tutorial. Just popped over here from Charlotte's blog. Thanks for the tutorial. 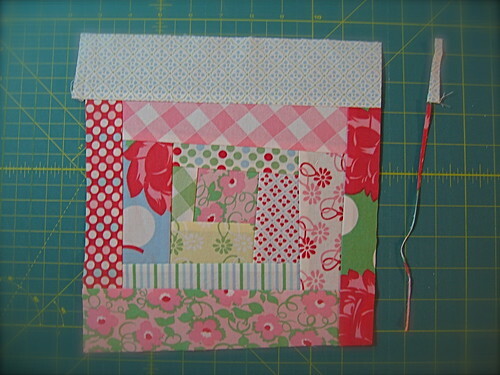 I really like the wonky log cabin block and I do love that fabric line. 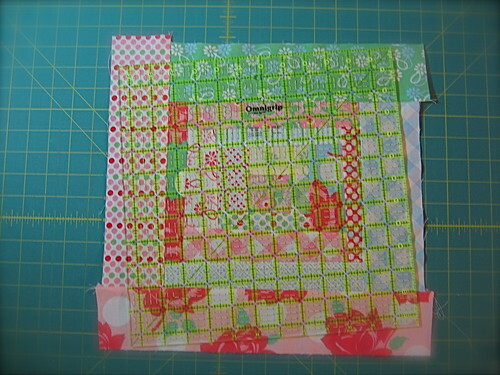 You have just solved one of my biggest unanswered questions about quilting! 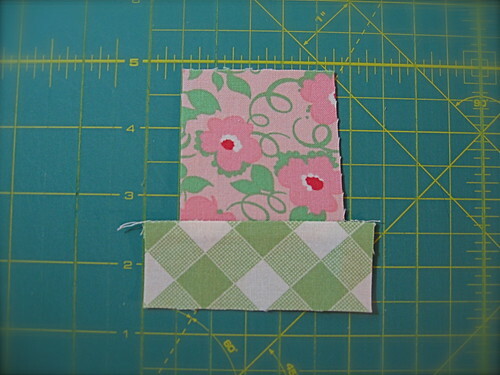 I've always looked at wonky blocks and wondered how people calculate the fabric required to put them in a quilt. 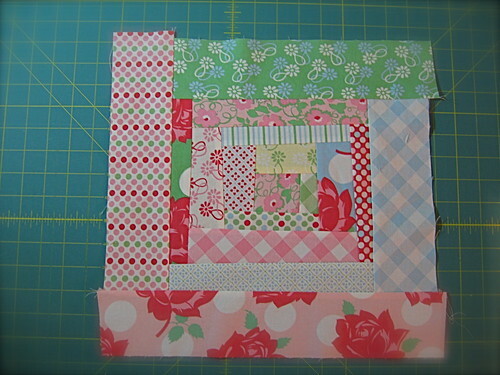 Seeing how you've sashed your wonky blocks gives me the confidence to attempt the wonky log cabin quilt of my dreams. Thank you!